The store has seen about 3,300 online merchandise orders since the UCMB win on Friday against UVA. It's average for online orders is around 1,500 orders all year. WASHINGTON — The University of Maryland-Baltimore County bookstore is having trouble keeping up with all of the online merchandise orders placed since Friday night’s historic win over the University of Virginia. The University of Maryland Baltimore County alumni hope that Friday night’s history-making win over the University of Virginia is just the beginning for the campus they call home. The store has seen about 3,300 online merchandise orders since the win. It’s average for online orders is around 1,500 orders all year. The 11 full-time employees and some student employees have been working around the clock all weekend to try to keep up with demand. Bookstore marketing manager Erin McGonigle said she has never seen anything like it. The store is asking for customer patience as employees do their best to fill the orders on time. Meanwhile, there is already new merchandise on the way to celebrate Friday’s victory, and Under Armor will be coming out with new clothes too. “We’re playing with the idea of ‘UMBC, You Must Be Cinderella,’ but other than that, we’re just letting our vendors have fun with it,” said McGonigle. Customers are getting creative, too. One person had white-out and a sharpie sent out with their order, so they could “fix” their bracket. 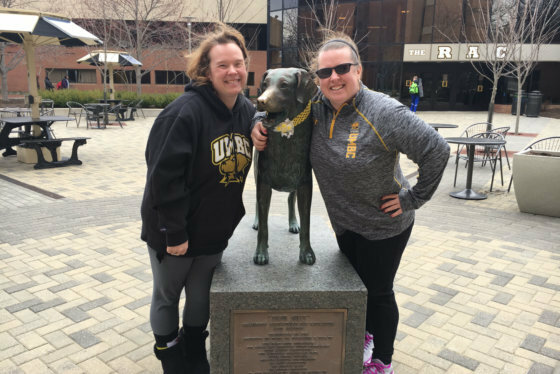 McGonigle, who graduated from UMBC in 2008, is riding the Retriever Fever as well. “It’s exciting from an alumni perspective, and exciting from the staff perspective,” she said. Lee’s Pint & Shell, a restaurant in Baltimore’s Canton neighborhood, hosted a watch party for Sunday night’s game against Kansas State. 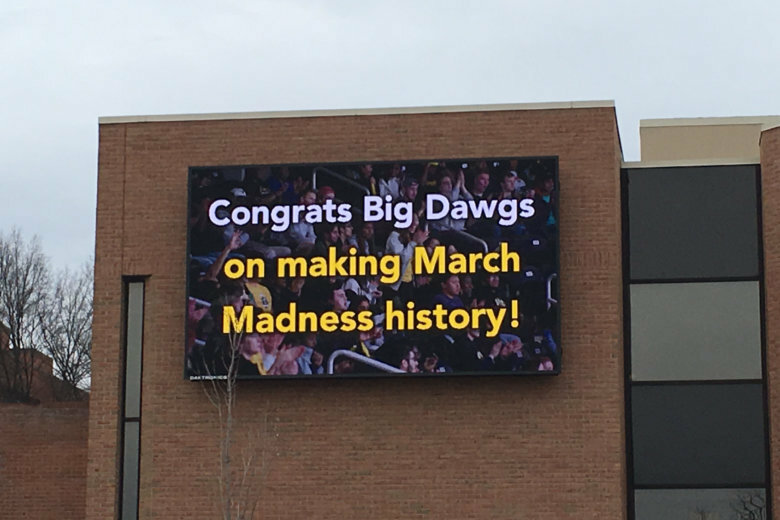 An official watch party was also held on UMBC’s campus, at The Commons Sports Zone.